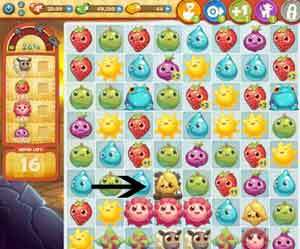 These Farm Heroes level 461 cheats and tips will help you beat level 461 of Farm Heroes. 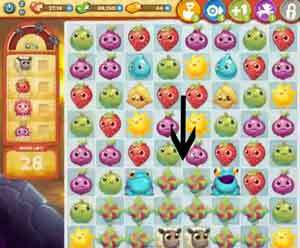 The objective of Farm Heroes level 461 is to collect 2 sheep, 95 strawberries, 12 flowers, and 95 onions in 28 moves. Focus on opening up the flowers first. The flowers will be the most time consuming to collect. Since they need three matches made to each one, make large combinations next to them to hit more than one at a time. There are two corn seeds on the board. Once a majority of the flowers have been collected, bring down the seeds to be by the sheep. In order to make hay you must combine the seed with a droplet of water. Once you have a hay patch you can begin moving the sheep to it. 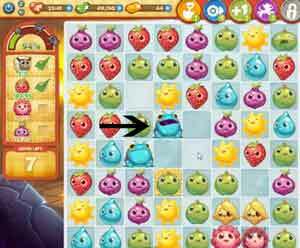 Level 461 Cheat #3: Watch out for the frogs. When you are trying to make a hay patch with the water droplets, be aware of the two frogs on the board. The frogs will try to take away the water droplets before you get the chance to combine it with the seed. If you get an opportunity to make hay, take it right away or the frogs will come grab the water droplet away!